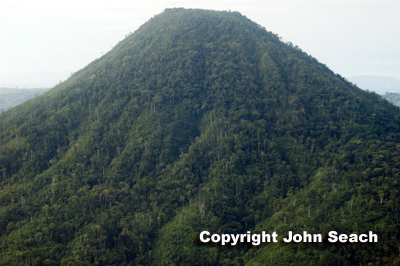 Lolo volcano is located 13 km north of Pago Volcano in New Britain. It is a nearly symmetrical steep-sided stratovolcano with upper slopes (above 300 m) of 35 deg. Between 150 and 250 m elevation slopes are 20 deg. There is a shallow well preserved summit crater (250 m long, 175 m wide, 60 m deep) and bare patches on the upper slopes. The cone has a base diameter of 4 km. The flanks of Lolo volcano have a radial pattern of steep-sided valleys up to 30 m deep. Most of the valley originate 70 m below the summit as small gullies. Some lava flows are well preserved and are visible from the air.